Just got the first XP machine with the Browser Ballot update on it. I clicked “next” and IE8 came up with a window asking me to choose my settings. I closed it and selected Firefox from the available options. Internet Explorer opened and downloaded Firefox. I installed it and the browser ballot window was still there. I closed the ballot window and rebooted. This thing is horribly broken. 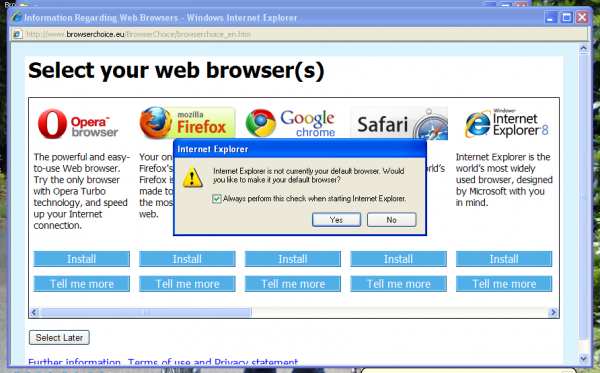 Even when you have installed another browser it tries to force you back to IE. It didn’t delete the IE icon off the desktop or Quick Launch either. This entry was written by mojo, posted on 24/02/2010 at 15:06, filed under idiots, Internet, software. Bookmark the permalink. Follow any comments here with the RSS feed for this post. Post a comment or leave a trackback: Trackback URL.